I’ve been extremely busy with my business lately. I’ve moved into Research, development, consulting, and contract cut and sew operations, so it’s been keeping me hopping. I still have more and more orthotists, Doctors, and patients contacting me daily for bodysuit, brace tailoring, or other needs, so that keeps me going as well. It feels really good when a patient contacts me and gives me encouragement to keep going – when they tell me the relief that they (or their kids) get from the garments that I pour so much into, it really makes my day. As an update with my kids – they are doing great in their Cheneau braces. My son is about a month into wearing his Cheneau full-time (which we hope he’ll only need to do for a few months, until we can pull the curve back a bit). Then he’ll start wearing his Tornado Suit more. We have found that clothing solutions that worked for my daughter (long-legged bodysuits paired with dresses), will NOT work for my son (for obvious reasons). He was always very thin, so we try to just go up a pants size, but they still slide quite a bit. So, of course, I went to the sewing machines and came up with a pants extension – I sew a 3″ strip of stetch knit to the top of the waistband, and a tight-fitting elastic around that. The extension goes up over the brace to the indent at the brace at the waist and holds tight, so his pants don’t slip down all day. When he wears shirts over the waist, you can’t even tell it’s there. The downside is that I have to sew the waist closed – so he can’t undo the snaps or the zipper – but, they are big enough that he can get them up and in place. And, most sweats and elastic waist pants work. I just did that on a couple pair of jeans we already had. A Tornado Suit update – from what I hear, Dr. Morningstar is partnering with several Doctors around the country to get this on patients and tested. Last I heard, patients can get it for about $200 during the testing phase, which may only be until Summer, when it becomes a standard bracing option. Insurance won’t cover it at this point, but $200 is a steal in the brace world and you’ll have before and after x-rays to determine if it’s helping your curve before you leave the office with it. His link is on my sidebar and he can probably set you up with someone in your area if this is an option you’d like to try. And, don’t forget that for a limited time, I’m supporting the effort with a free bodysuit with each Tornado suit. He’s getting good data so far – just email him or call their offices and ask for the details. He’s excited about helping patients with Scoliosis! Well, my assistant just came to me with issues from the production floor, so I must go. I pray each one of you has a blessed week and can find solutions to help you be more comfortable and more healed every day. As many of you know, yesterday was Ash Wednesday, which, in the Christian calendar, starts the season of Lent. Lent means different things to different people – but, for me, it is a time to reflect, to turn to God, and to consider all of His sacrifices. These past few months have been incredibly stressful for me – and a few days ago I was honestly on the edge of a nervous breakdown. On top of the well-known things on my plate – running a family with 2 kids with special needs, running a business, working as a church choir director, to name a few – I had all sorts of other matters weighing on me – matters I can’t really discuss, but that were pushing me to the edge of my sanity. Needless to say, I knew something had to be done. It is very timely that this happened to me on the brink of heading into Lent. So, I decided that for these 40 days, I’m not going to give up sweets (I’m already doing quite a bit of that anyway), or anything like that – but, I decided to give up worry – specifically worry about the future. I am a worrier by nature (thanks, Dad!) 🙂 But, I like to say I’m a reformed worrier – I still worry, but I usually make a conscious effort to “let go and let God”. Sometimes the disease of worry can creep back on me, though, as I start to contemplate where we are going and what to do about my children’s health, and where will I ever find the time??? I figure there is a difference between considering the future and worrying about it. Considering it is healthy – so one can plan, establish priorities, and move forward. Worrying about it – not healthy – and, not necessary. It will do nothing to change or fix anything. So, I am deciding for the 40 days of Lent to remember that God is in charge and I am just his vessel, that he will make known to me in HIS time what he has in store for me and my family, and that all I can EVER do is to rely on him. Most readers of this blog understand that I am a Christian. Everything I do stems from a desire to please Christ. Some of you may tolerate it (just talk about Scoliosis, for goodness sake!) 🙂 But, some of you have written to me and expressed that you are blessed by my revelations on this blog, and I am so grateful for those emails and comments. For those of you who don’t share my faith, I also urge you to email me or comment – in a constructive way, of course. If you crave the faith I describe – the faith that can pull you out of the ravine of stress and depression time and time again and give hope no matter what your plight – email me. We can discuss it. I firmly feel that the greatest tool in any parent’s toolbox is a strong faith. I’m not referring to Religion – empty motions – but true faith. And, when dealing with a child with Scoliosis, or any other special need, it’s so much more important yet. Can we exist without it? Sure. Can we be great people and great parents without it? Well, aside from our original sinful nature, yes. But, can we really be full without it – complete? I guess that is for you, the reader, to decide. I look forward to writing next week – we will see just how “worry free” I’ve been able to be! In the meantime, I pray that you all exprience wonderful blessings this week, in the midst of all the other crazy life stuff. Introducing the new EmBraced In Comfort Bodysuit for HIM, the Brace-Tee, and Brace-Shorts! Well, exhaustion has set in as I’ve been wrestling with my website (www.EmBracedInComfort.com) to get all these new product options up there, but alas, these new products are now available to purchase online. 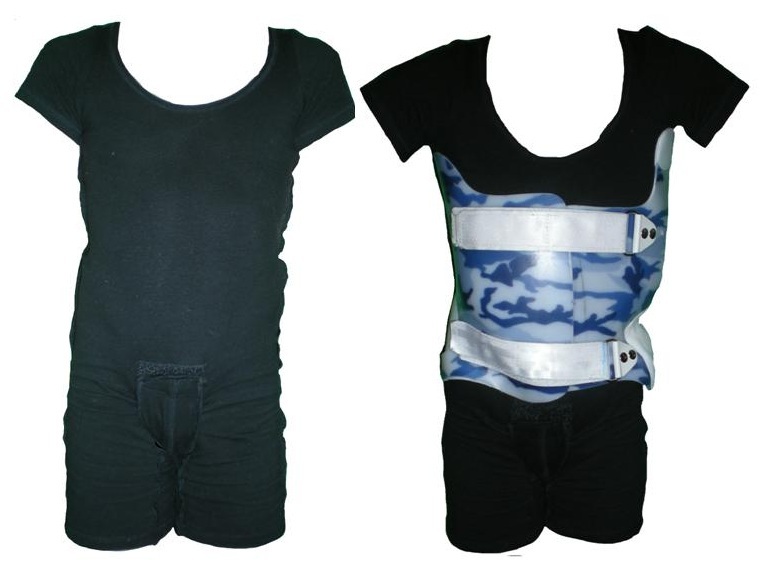 First, the EmBraced In Comfort Bodysuit for HIM – the original bodysuit was developed with the female body in mind, so when my son went into a brace, I figured it was high time the Boys and Men out there got a suit specifically designed for them. Kind of a hybrid between a gymnastic and wrestling unitard, this bodysuit offers all the coverage and ease of use of the traditional suit, but is designed with the male anatomy and needs in mind. My son loves his suits under his Cheneau brace – it stays put underneath (no creeping up the back) and makes it easy for him to use the restroom. Front view of the bodysuit, in and out of his cool new brace. 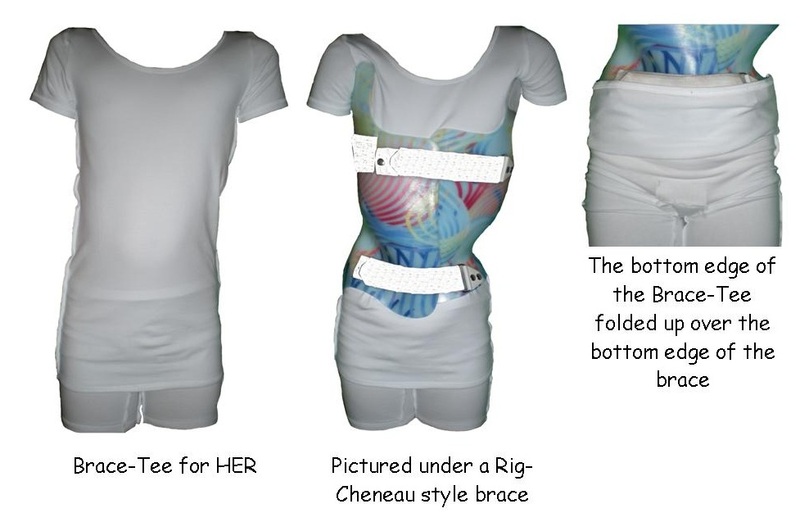 Secondly, the EmBraced In Comfort Brace-Tee – avaiable for both HIM and HER – the sizes match the bodysuit sizes. This Brace-Tee offers some additional features to just using a regular old T-shirt under a brace. First, it’s more form-fitting, the neckline is lower and rests closer to the body. The seams on the sides are located outside the garment, and the bottom is longer and elasticized so that your patient can wrap the bottom up and over the bottom of the brace – to provide stability and to protect the hips and legs from rubbing from a hard brace. Pictured below is the Brace-Tee for HER. Lastly, I had a few customers request a shorts-only option for the EmBraced In Comfort bodysuit, so I’m happy to introduce the new EmBraced In Comfort Brace-Shorts. These are also available for HIM or HER and work great with the Spinecor shorts. Some patients live in warm climates and are not bothered by the straps, but still want the shorts to protect them from the brace and to facilitate easy restroom use. 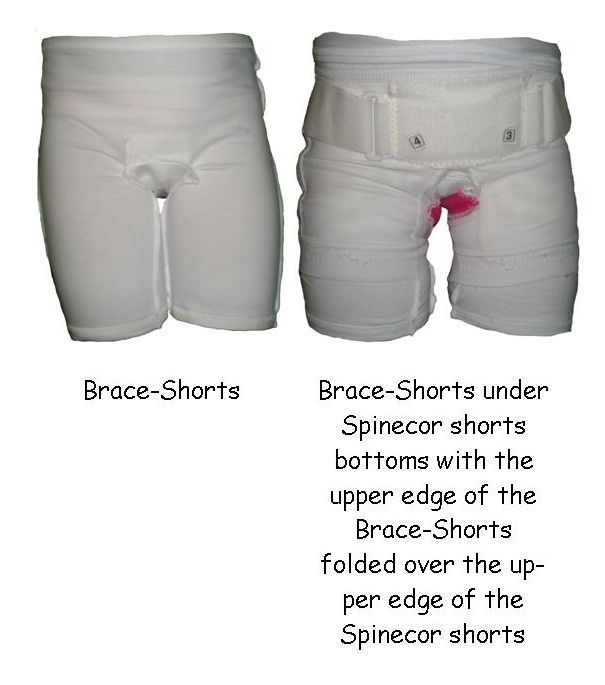 The top of the EmBraced In Comfort Brace-Shorts can fold over the top edge of the Spinecor (or other type) of brace shorts. Well, I’m going to go collapse now. Let me know of your feedback on these great new products. After all, I created them because people were needing them and asking for them…hopefully they’ll help a Scoliosis patient in your life, too.